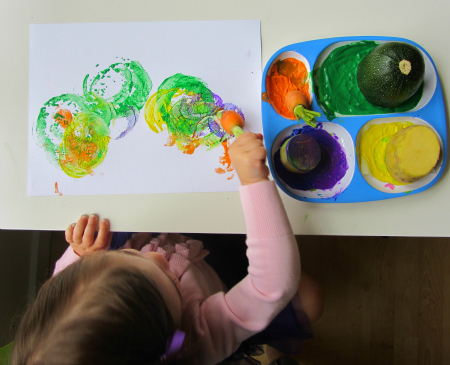 Painting without a brush is one of my favorite thing to do with kids, especially toddlers who have a hard time controlling small paint brushes. 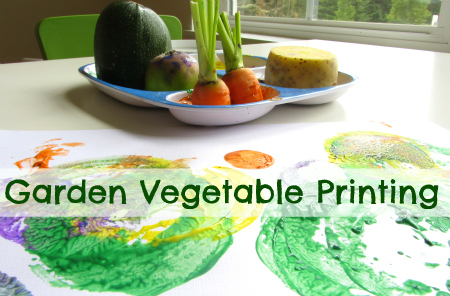 This vegetable printing project is perfect for toddlers. We have painted with fly swatters, trucks, and other vegetables but this was the first time we have picked the fruit and veggies from our own garden. 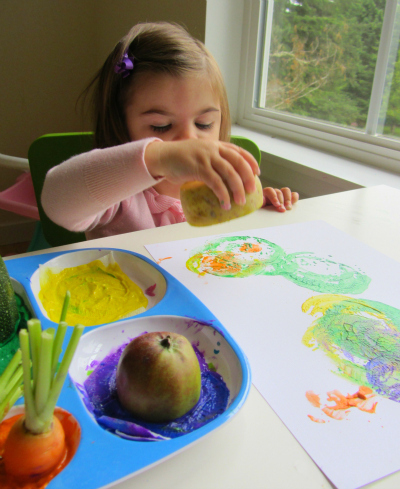 Using fruits and vegetables for art can have great influence on eating them as you will see. 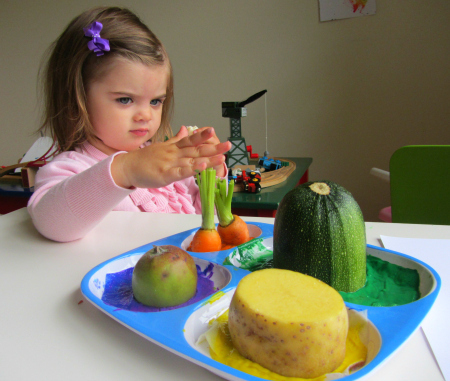 Don’t shy away from playing with food, especially if you have a picky eater. 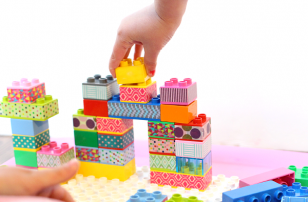 Gather your materials. 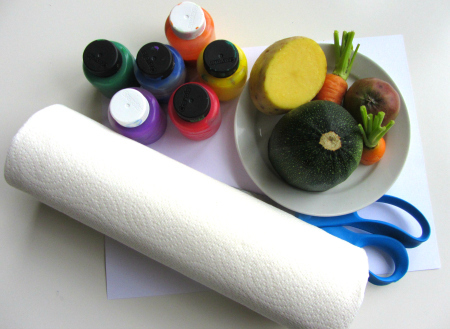 You will need a few veggies and or fruits ( we used zucchini, carrots, an apple and potato) , paper, paint, paper towel, scissors and a dish or two. 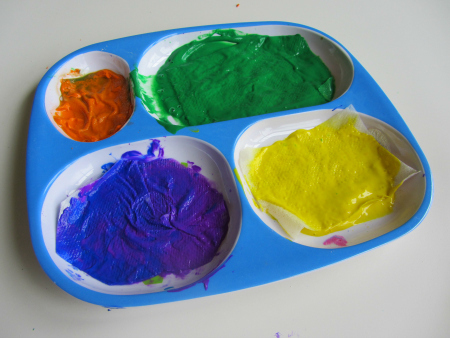 Start by pouring paint in the dish and I added pieces of paper towel soaked in the paint , this just helps stop the paint from glopping on too think. 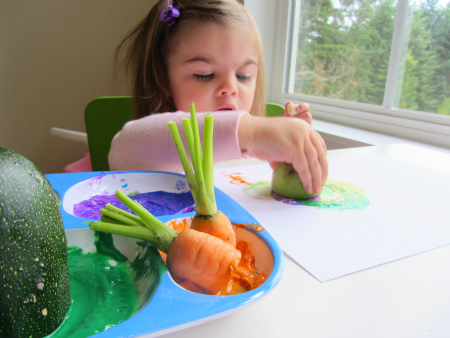 Add the cut veggies and fruit and call your little artist to check them out. She told me what each was and then told me who in our family likes and dislikes each. She was right. 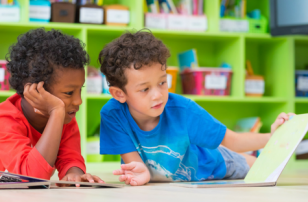 Kids are fascinating and are listening even when we don’t think they are. I thought it was cool how she banged the carrots really hard and fast, but the rest were handled carefully. I moved the paper around as she worked because she is too small to reach the far side. 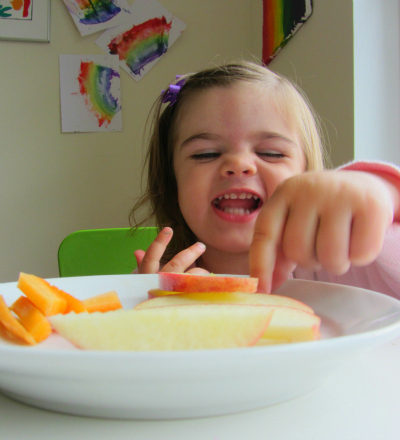 After she was done printing, I cut up some apple and carrots for a snack. 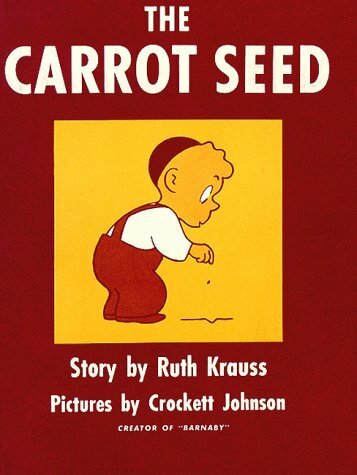 The Carrot Seed by Ruth Krauss is a rare gem, it has been in print for over 60 years and has delighted generations. If you aren”™t familiar with the story, a little boy plants a carrot seed and everyone tells him “It won”™t come up”. 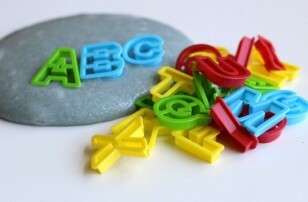 This doesn”™t stop the little boy from patiently taking care of this little seed. And then, it eventually grows into a giant carrot. The message is a universal one of sticking to your guns even when everyone tells you to give up. My son loved the story the simple pictures which bring you back to your own childhood. At least they did for me. A true classic. Fun! She is adorable. 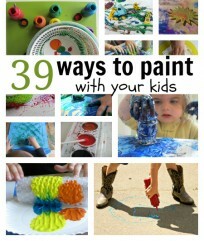 I have a little toddler that would love this too. Thanks for sharing! 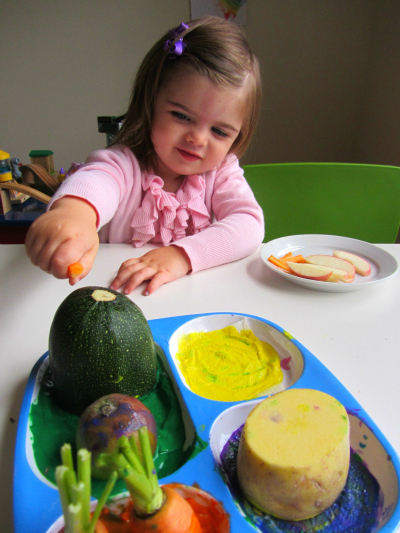 Your daughter is having a great time, dipping those veggies! I also love the Carrots Seed book. 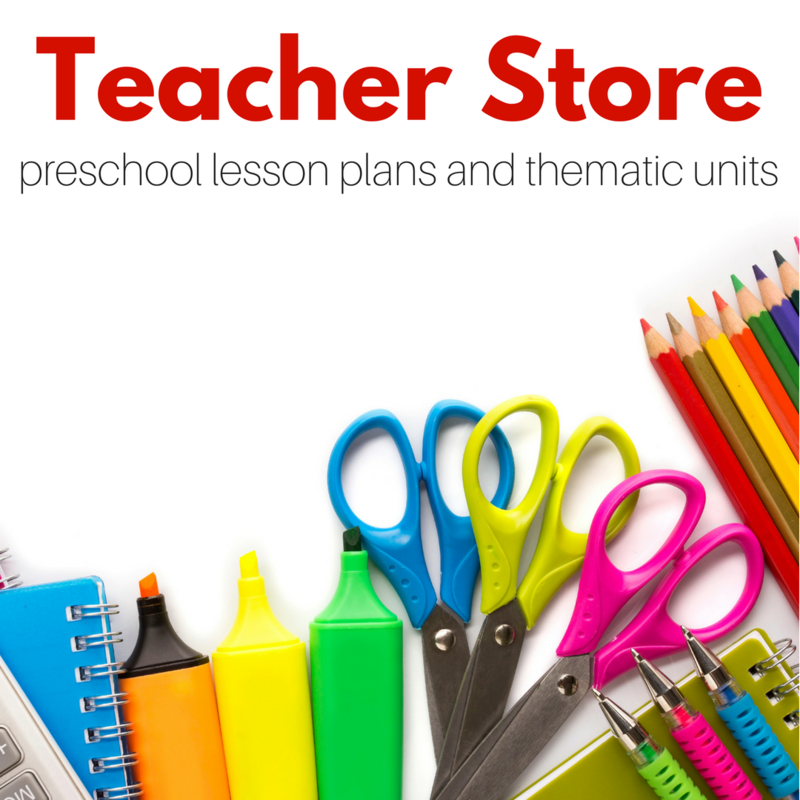 Read it many time to my pre-schoolers. They loved it! 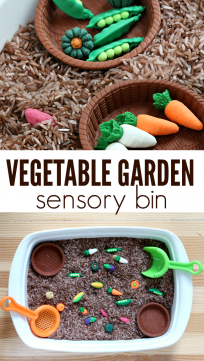 Great and fun homemade idea Garden Vegetable Printing! Your daughter is such a celebrity. 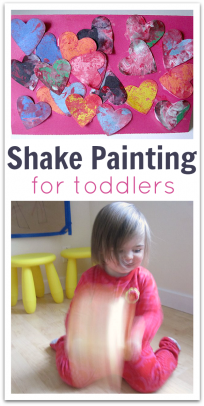 Every time I’m looking for kid crafts, if I see her face, I know it’s a cool craft that my little girls will be able to enjoy. Thanks so much for all the great ideas and for making my day with that beautiful child! Oh thank you I am glad my ideas are reliable! I think she is pretty special but I am a wee bit biased ! Have you tried celery? If you buy a standard celery ‘bunch’ (many stalks joined together at the bottom) & cut off those stalks an inch or so up, it makes a great ‘rose’ print, as each of the curved stalks looks like a rose petal. Plus, you can eat all the celery!